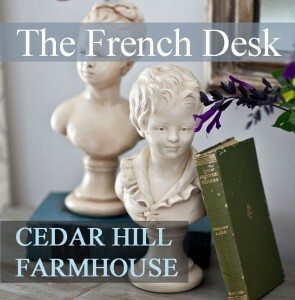 It's time for our monthly French Country Style Series where I and three other bloggers who love French Country or French style share some decorating ideas. Their links will be at the end of the post. Since it is spring it is time to change things up a bit around the house so I changed up the vignette on the tufted ottoman in the great room again. This vignette has a French country feel to it. I just grabbed some things I had on hand and it all works well with the rest of the room. I used one of my French confit pots and added some dried eucalyptus that was fresh a few short weeks ago. I love using my favorite French style figurine. I love these little balls I found in Savannah at The Paris Market and added them to this scallop edged ironstone bowl. Vintage binoculars sit on the books. Everything fills this large bamboo tray so I can created this vignette on the tufted ottoman. I hope I have inspired you to create a fresh new vignette in your home. 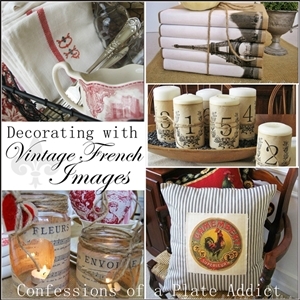 Be sure to check out some more French Country Style ideas from my friends below. Always love seeing your newly created vignettes...beautiful!!! Looks good. What are those little balls made of? Love your vignette. Everything looks so fresh and crisp. Have a good Sunday!!! I look forward to any changes you make Kim! Cute vignette! Amei a sua decoração, bom dia! Love how your create such beautiful vignettes Kim! I love your new arrangement! Where did you find that pretty eucalyptus? I never seem to find it fresh around here. A charming vignette, Kim. Love your Frenchy figurine, and I see my favorite pillow on the sofa. Bovine love! Kim, I love the vignette you created on your ottoman! I have a tray on top of my kitchen cabinets that I never use and this post makes me want to bring it down and dust it off:) thanks so much! Lovely styling. I love the confit pot. Beautiful job! Oh yes Kim, your French country style is right up there with what ones know to be Flrench Country. Love your style so much so it truly beckons me to introduce some colour, yet muted tones of yellow/golds and bleus would be a good starting point for me! I love the figures and pot filled with dried eucalyptus and best it that red sofa that's the perfect back drop to your French home. Love the other ladies here as well and I visit often. 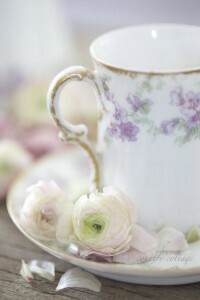 Thank you dear for taking time to visit my Rural rustic French home and taking notice of my cabinet chest, your a doll. So charming Kim- love your vignette! You're really good at creating charming and interesting vignettes. Gorgeous! Kim, I always find inspiration at your blog, and I'm still loving your red couch as I always have in that sun soaked room! We're going to Savannah in June so I hope to leave with some treasures as you did!